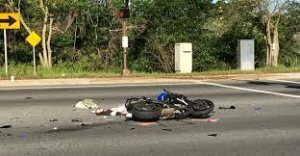 Dustin Blake Swisher Killed After Motorcycle Accident In Fort Lauderdale | Schuler, Halvorson, Weisser, Zoeller & Overbeck P.A. FORT LAUDERDALE, Fla. — A 39-year-old motorcyclist has been identified after he crashed and plunged about off an Interstate 95 ramp in Palm Beach County during rush hour in South Florida. The Florida Patrol said Dustin Blake Swisher was riding a 2005 Suzuki GSX-R eastbound on Broward Boulevard. Swisher was entering the northbound entrance ramp but failed to negotiate a left curve, causing his motorcycle to collide with a truck. FHP said, when his motorcycle hit the truck it caused Swisher to be separated from his Suzuki and fall about 60 feet from the entrance ramp flyover onto the interstate below. Swisher came to a final rest on the east-paved shoulder of southbound I-95 and was pronounced dead at the scene. The truck driver was not injured in the crash, although witnesses said he was unconscious due to the shock. The crash caused multiple lanes of I-95 southbound to be closed causing major delays for commuters. The FHP report did not indicate Swisher’s city or state of residence. The Florida Highway Patrol said, a 22-year old passenger in the truck was critically injured, and a 16-year old passenger suffered minor injuries. Investigators said if anyone has any information about the wreck, call the Florida Highway Patrol.